We hope you enjoy our Photo Album and we invite you to return often to see the new images that we add throughout the season! 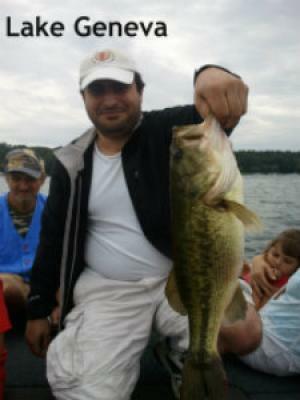 Even better - contact us and let us help plan your next great fishing adventure! CLICK HERE to return to the Photo Album Index! © Illinois and Wisconsin fishing guide Captain Doug Kloet offers fishing guide services and trips on the waters of Fox Chain of Lakes near Antioch Illinois, Lake Michigan at Waukegan Illinois, Silver Lake in Kenosha County Wisconsin, Lake Geneva Wisconsin, Pewaukee Lake Waukesha County Wisconsin, Milwaukee Harbor in Milwaukee Wisconsin, Fox River Bay of Green Bay at DePere Wisconsin and the Bay of Green Bay in Wisconsin. Fishing guide trips for musky, walleye, largemouth bass, smallmouth bass, northern pike, perch, crappie, bluegill, brown trout, lake trout and steelhead trout.